I am quite sure many of you that does not have a nice fingernail are not really happy about it. It brings down your confidence and self esteem, because you tend to hide it from been displayed in the pubkic. You look at all the celebrities with their amazing nails and beautiful nail art, in magazines, and wonder how they have such healthy fingernails. Well, they follow certain beauty tips for healthy nails to attain that status. Beautiful nails can instantly boost your style quotient naturally because if you have healthy nails, then you can experiment with various types of nail art. Imagine having unruly, brittle nails that break easily, well, it can be quite unattractive, not to mention unhealthy. Especially in this day and age, where young women are constantly taking 'selfies' of themselves, in which the hand and nails are often seen closely, having beautiful nails has become very important indeed. 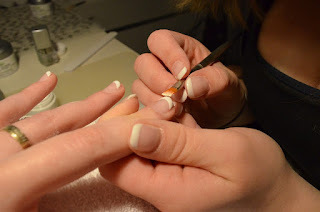 So, if you yearn to have healthy nails, then you must follow certain nail care tips that can give you beautiful nails. Many a times, due to reasons like an unhealthy diet, poor nail care routine, habits like biting on nails, etc., your nails tend to lose their beauty and health. So, here are a few tips for getting those healthy, lovely nails, which actually work! Have a look. Tips for healthy nails include rubbing a bit of petroleum jelly around your nails and on your cuticles, at least once in a day, to keep your nails softer and hydrated. One of the most important nail care tips is to wear rubber gloves while you are doing household chores like washing the dishes, gardening, doing the laundry, etc., to protect your nails from the effects of harmful chemicals. If you are attempting to do a manicure on your own, be very gentle, especially while pushing back the cuticles in order to avoid further damage. Tips for beautiful nails include making sure that you do not have ingrown nails, as they may lead to brittle nails and infections. Yet another tip for healthy toe nails includes wearing socks that are of good quality and keeping your shoes clean in order to avoid fungal infections. Taking care of your nails involves filing your nails in just one direction and not going back and forth while filing your nails in order to avoid damage. A tip for healthy nails includes massaging your nails and cuticles regularly using essential oils or vitamin E oil.